Just as it was with my sudden paintings, my sudden music gave a glimmer of warning before the actual lightning strike through my entire being. I need to play the piano. Now. Oh, no … not the piano, of all things, it can’t be so. I am perplexed to the point of panic. This happens in the first week of October, 2013, three months after my sudden artistic output of paintings. It seems quite mad. There is no piano in the house – there never has been, in all my life. How am I supposed to play an instrument I know nothing about? But once again my brain kicks in to get me moving. Pianos need to be tuned, don’t they, so how about a Japanese digital piano then? After checking stores and the internet it seems the right decision to choose the 88-key Casio PX850. I also select a piano stool and both are delivered to the third floor of my 300-year-old minka. This is all done within one week after my first piano inkling. But now what? The new black digital piano shines sleek and elegant in the room. I sit on the stool and realize I don’t even understand what the piano’s three foot pedals are for. Following set-up instructions, I switch on the piano and put my hands on the keyboard. And that’s all it takes. Music immediately moves through my fingers, shocking and delighting me. When the piece is done I have no idea how or what I played and I know I can never play it again. So I will have to record my playing. That involves further research and my first recording effort is not well done. But at least I am able to capture the beautiful melody I call Return 02. The digital piano accepts a USB flash drive, which I learn to use, and my recording begins in earnest. 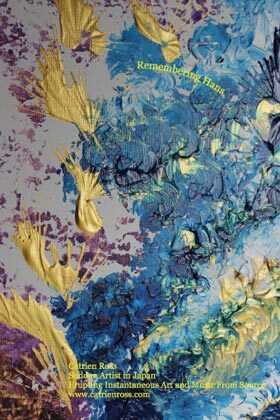 Like my paintings, one after another the original piano compositions erupt. Each piece has a clear beginning and a clear end. Some pieces go on for more than twenty minutes. I use both right and left hands together on the keyboard. I do not know where my hands go, trusting only in the natural movements that flow through me. When a piece is done I can never replay it. But somehow, that’s all right. In December 2013, I choose a selection from my many recorded compositions and release a 66-minute CD, Music from Source. The compositions are left exactly as they erupted, as they were played in the moment. I find that just as my body responds whenever I face an empty canvas, I have a physical response when I sit at the piano. All I need to do is put my hands on the keyboard, and the movement wells up from within. It is an upwelling of deep joy and trust. Once I start playing it feels as if I am playing vibrations within myself – sounding the unique melody of me, as it were. When Dr. Hans Laetz died in 2014 my grief poured through my fingers at the piano. In December, 2014, I released a second 66-minute CD, Remembering Hans. My sudden music continues to flow forth mysteriously in an effortless stream I no longer try to explain. How is it possible for someone with no study or experience whatsoever of the piano to suddenly play one original composition after another on an instrument she knows nothing about? But clearly I do know things I have never learned about the piano, clearly I do know things I have never learned about music. This knowing is expressed as a sudden and assured awareness whenever I sit at the piano to “play” my compositions. Uninhibited trust, joyful confidence, an unfurling of inner vistas. The mystery of my sudden music frees the confines of the heart. Catrien Ross has no study or training in piano whatsoever. Three months after experiencing her sudden artistic output of paintings, she found herself able to sit at a piano – the first piano ever in her life – and allow her hands to play one spontaneous piano composition after the other. Without knowing anything about piano music or technique, she plays her original piano pieces instantaneously and effortlessly from start to finish. Mysteriously, each piano piece, which always has a clear beginning and an end, erupts in its entirety once only. So every piano piece is a one-time phenomenon that must be recorded live as she plays. 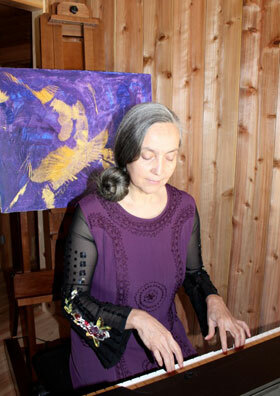 Since her sudden artistic eruption in October, 2013, Catrien Ross has live recorded more than 100 instantaneous compositions. Remembering Hans is a new CD album release in December, 2014. This 66-minute, four-track CD is a collection of sudden music that erupted in loving memory of Dr. Johann Gottlieb “Hans” Laetz and the 38-year relationship he and Catrien Ross cherished. Hans’ Death (Track 1) erupted four days after Hans died on September 23, 2014. Outside of Japan CD is available at Catrien Ross Japan online store. 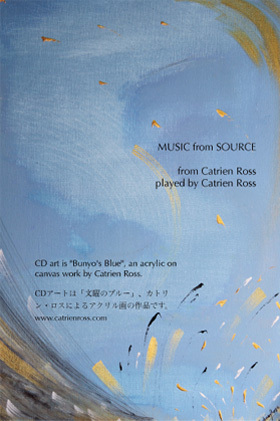 Music From Source:Return – Variations was released in December 2013, three months after Catrien Ross first manifested her new ability to instantaneously play the piano. This 66-minute, five-track CD presents some of the piano pieces that began flowing forth effortlessly as a result of her sudden artistic eruption. An imperfect recording of an early melody. Just enjoy its inspiration!